Gilbert Cheng(1st on left), HKJC's Head of Retail, Sustainable Committee Member, Su Zonghai(1st on right), Deputy Secretary-General of China Green Carbon Foundation, Chen Junqin(2nd on right), Inspector and Party Member of the Forestry Department of Guangdong Province, Li Chunhui(2nd on left), Vice Governor of Longchuan County, were planting trees at the project site. Long committed to promoting sustainable development, The Hong Kong Jockey Club has recently donated RMB2.89 million to the China Green Carbon Foundation to establish the second phase of HKJC Forest carbon sequestration project at the source of the Dongjiang (East River) – a major drinking water source for Hong Kong, with the objective of tackling climate change and protecting the environment. 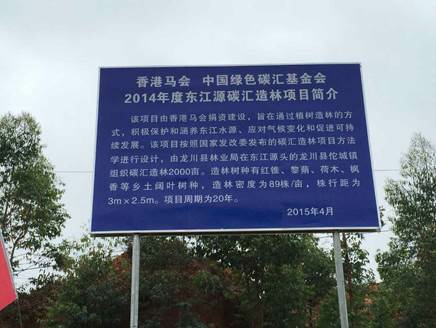 Together with the first phase, the Club has planted a total of over 350 thousand trees at Dongjiang, with total afforested area amounts 4,000 mu in size (equivalent to 374 standard football field) and donation exceeds RMB5.5 million. It is estimated that 100 thousand tons of carbon dioxide can be absorbed by the afforested area in 20 years, which helps mitigate climate change and improve local ecological habitat. 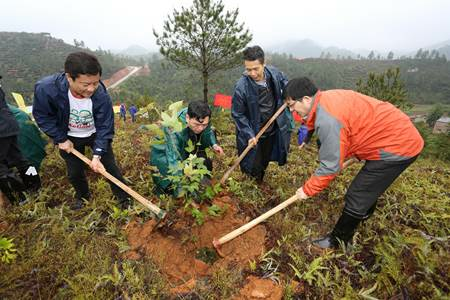 The second phase of HKJC Forest carbon sequestration project was officially launched in Longchuan County, part of Heyuan City in Guangdong Province. The Club's Head of Retail Gilbert Cheng joined at a plaque unveiling ceremony by Inspector and Party Member of the Forestry Department of Guangdong Province Chen Junqin, Deputy Secretary-General of the China Green Carbon Foundation Su Zonghai, Director of Heyuan City Forestry Administration Zhang Fucheng, Party Secretary of Longchuan County Duan Bangxian. The guests joined forces with Green Ambassadors from the Club to plant a number of trees to embark on the project. 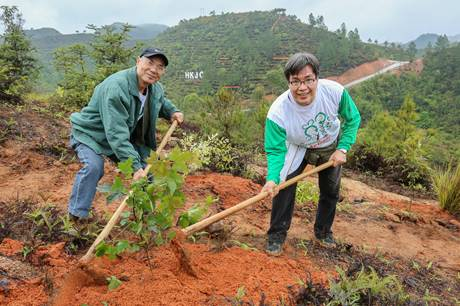 Mr Cheung told guests that the number of participating Green Ambassadors doubles in this new plantation activities and plaque unveiling ceremony, showing great effectiveness the project has in promoting green culture to the workforce, not to mention the fact that both the ecological habitat and local economy can be improved. Mr Chen said the Club’s donations to the project for two-consecutive years and the organization of tree planting activity reflect the effective implementation and promotion of sustainability and green culture by the Club, it had also set a good role model of charitable activities. "We look forward to see even more organizations and the public to participate in eco-building with the good example set by The Hong Kong Jockey Club. " He said. The Club appointed a research institute to investigate the long-term benefits brought by HKJC Forest. According to investigation result, HKJC Forest can increases forest size, improves ecological habitat, enhances bio-diversity, protects Hong Kong’s drinking water source, as well as creates job opportunities for farmers at the Dongjiang source. Since 1984, the Club's Charities Trust has donated a total of over HK$700 million to environmental and charity projects. 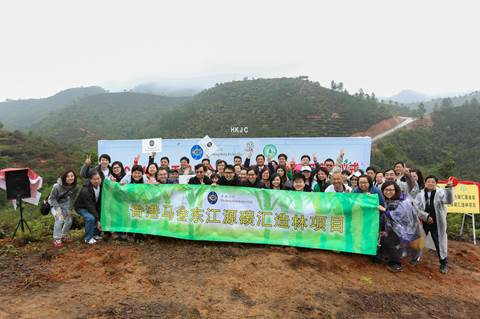 The new phase of HKJC Forest is the second large-scale environmental project funded by the Club in Mainland China, and involves the planting of indigenous broad-leaved tree species appropriate for growth at the Dongjiang source to create a mixed forest that will improve biodiversity and bring ecological benefits with a wide variety of tree species. Founded in 1884, The Hong Kong Jockey Club is a world-class horse racing operator and Hong Kong’s largest community benefactor, as well as one of Asia’s most prestigious membership clubs. Operating as a not-for-profit organisation, the Club allocates its surplus funds for charitable and community projects. In 2013/14, its donations reached a record HK$3.6 billion, and in the last decade alone it supported over 1,275 projects. The Club is also Hong Kong’s largest single taxpayer, contributing a record HK$19.58 billion in 2013/14. With about 70% of its revenue given back to society every year through donations and tax contributions, The Hong Kong Jockey Club delivers a significantly higher return to the community than any other racing and/or sports betting organisation in the world. As a socially responsible organisation, the Club helps Government combat illegal betting and advocates responsible gambling. The Club is also one of Hong Kong’s largest employers with over 24,800 full-time and part-time staff. Committed to global excellence and giving back to society, the Club is always “riding high together for a better future” with the people of Hong Kong. Please visit website 130.hkjc.com.